The MLB draft was today. If you didn't know that, you're not alone. It's lack of popularity places it just ahead of the military draft. 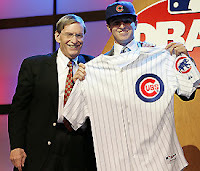 The Cubs picked third and drafted high school 3B Josh Vitters. I'm told by those who know more than I do that this is a good pick. Sure he's in high school, but that's ok, we have the slowest runner in baseball history (you're off the hook Cecil Fielder!) manning the hot corner for the foreseeable future. Surely we'll switch this guy over to SS or 2B at some point. What a great thrill for this high school lad. When I was his age I was taping episodes of Charles in Charge on TBS, laughing at the antics of Charles and Buddy while consuming taco salads and french fries. Sadly that is not a joke. My keyboard is wet with tears.